Enabling secure ways to share and collaborate on content with people inside and outside your organization is critical to improving teamwork and productivity. According to Gartner, “By 2020, 80 percent of large and midsize organizations in mature regions will have deployed one or more content collaboration platform (CCP) products to implement a content productivity and collaboration strategy.” But, if it’s not familiar and easy to use, user adoption is limited. That’s why Microsoft OneDrive allows you to work securely from any device on any platform from your desktop, from the web or from our mobile app, and is designed to work with the productivity and collaboration tools your employees use every day. What do our customers think? With over 85 percent of the Fortune 500 companies having OneDrive and SharePoint across 250,000 organizations worldwide, we are delivering on our vision of a more connected workplace. In fact, usage of OneDrive for Business has more than doubled in the last year alone. Today, we are happy to announce that Gartner has recognized Microsoft as a Leader in the new CCP Magic Quadrant Report for 2017. 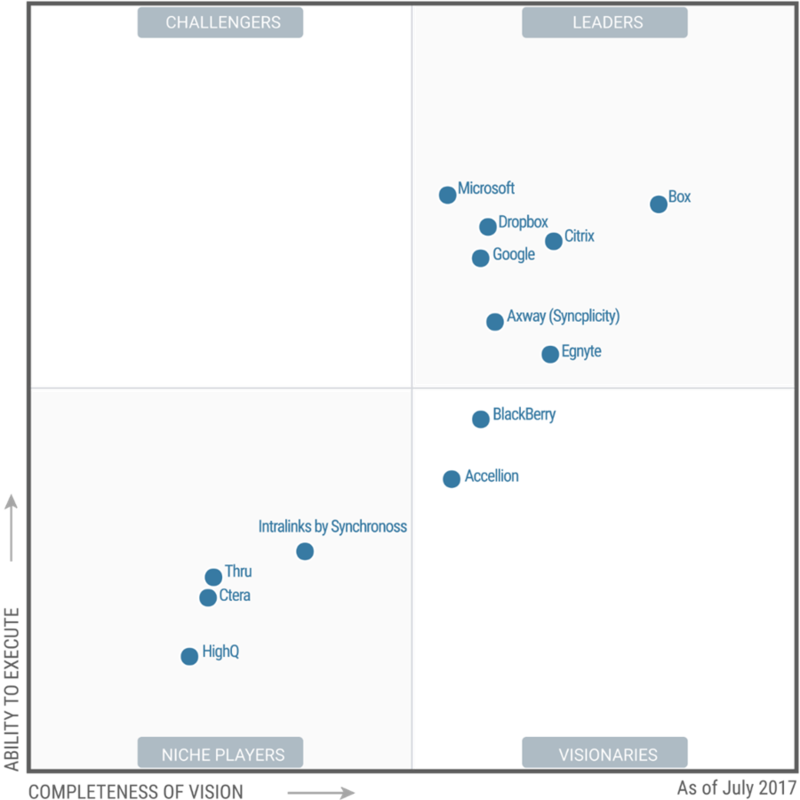 In addition to being positioned as a Leader, Microsoft was placed highest for Ability to Execute. Each year, Gartner evaluates vendors in the enterprise file sync and share market (now Content Collaboration Platforms). It then looks at a variety of key features and functionality across 13 areas, including simplicity and usability, security and data protection, analytics, user productivity and other. Best with Office 365—OneDrive is included with your Office 365 subscription, and is the only solution that enables you to edit and co-author from within Office across the browser, mobile and desktop apps, along with intelligent discovery and insights powered by the Microsoft Graph. Support for a broad range of file types—In addition to Office files, OneDrive now supports over 270 file types, including Adobe Photoshop (PSD), Illustrator (AI), Acrobat (PDF), as well as 3D formats and DICOM images. Security and IT confidence—OneDrive leverages Microsoft security capabilities such as Data Loss Prevention (DLP), eDiscovery, Bring Your Own Key (BYOK) and Data Retention controls with consistent management across Office 365. Deployment flexibility—Customers can choose their deployment model—cloud, hybrid or on-premises—and leverage no-cost, Microsoft FastTrack deployment, adoption and migration services. Cloud leadership and compliance—With 100+ global datacenters and Microsoft’s global network edge—combined with compliance standards, including ISO 27001, FISMA and EU Model Clauses—we offer customers trusted enterprise-grade compliance and security. 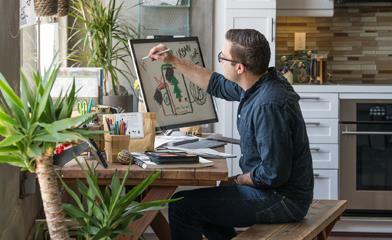 To learn more about how OneDrive can help you do more, visit our website. Also, make sure to join us at Microsoft Ignite, September 25 -29, 2017, where we are looking forward to sharing what’s next for OneDrive, SharePoint and the rest of Office 365 with you and over 20,000 of your peers. Get your own complimentary copy of the Gartner Content Collaborations Platforms Magic Quadrant report.